The entire area of land that drains, or ‘sheds’, its rain or snow melt into a particular river is known as the watershed of that river. 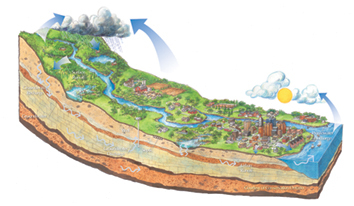 The area surrounding a smaller river or creek which contributes to a larger river system, is called a subwatershed. For example, since the West Credit River contributes water to the Credit River, the area surrounding the West Credit River is considered to be a subwatershed. Situated within one of the most-densely populated regions of Canada, the Credit River Watershed contains some of the most diverse landscapes in southern Ontario. In this area, the Carolinian Forest zone meets the Deciduous Forest zone, both of which contain unique species not found in other zones. The Niagara Escarpment and the Oak Ridges Moraine also run through the watershed, further increasing the number and diversity of plants, animals, and communities. 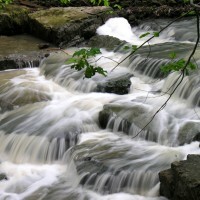 The Credit River is almost 90 km long and meanders southeast from its headwaters in Orangeville, Erin and Mono, through nine municipalities, eventually draining into Lake Ontario at Port Credit, Mississauga. CVC has also been given the responsibility of monitoring and protecting the health of other local watersheds, such as the small watersheds in Mississauga and Oakville that feed into Lake Ontario. Examples of these include Cooksville Creek and Sheridan Creek.